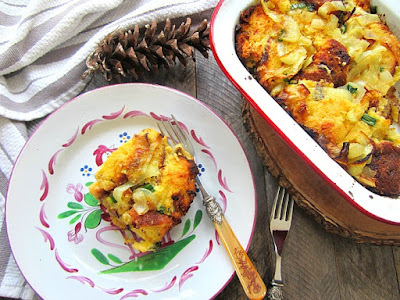 This wins for the best thing to do with your leftover, dried out cornbread from Thanksgiving. 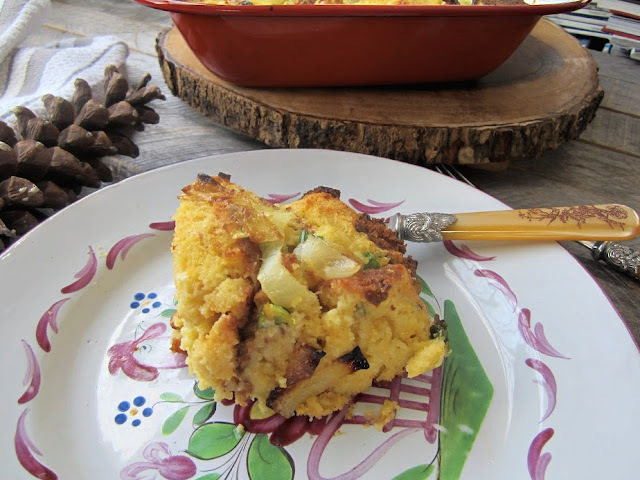 Double the fun and make a cornbread pudding! It's sort of like my turkey pot pie....I make it once a year, with the leftover turkey. Same goes for the cornbread. I make this fabulous recipe, then freeze the leftovers for a day like today. This recipe is the perfect breakfast for Christmas morning or a Sunday when you want to surprise everyone, and it doesn't require much effort. I used about 3 cups of leftover cornbread (mine was made w/ bacon, scallions, cheddar and jalapenos, so it was extra good!). 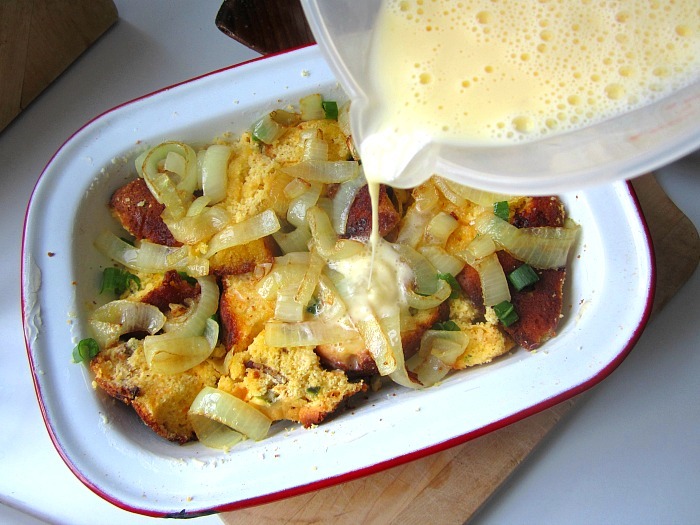 Lay the hunks of cornbread in a greased baking dish (size will depend on how much you are using). Saute 1 large yellow onion, sliced, in butter until soft, and golden. 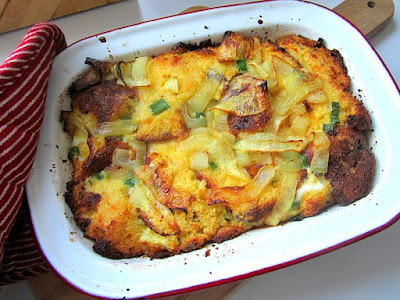 Spoon the cooked onions on top of the cornbread in the dish. Make a custard from 2 eggs mixed with 1 cup of milk. You can add another egg and more milk/cream if it looks too dry. The right amount of custard should be enough to cover your bread cubes and soak up the liquid. Press down the mixture w/ a spatula so all the cornbread is covered. Bake 30 minutes in a 350F oven. Let cool before serving. That looks good enough to be the dressing on Thanksgiving Day. Yum!